ALL NEW SHAPE, 4.0 GALLON CAN WITH 2 HANDLE DESIGN. EASY POUR SPOUT THAT CAN BE PERSONALIZED WITH NAME AND NUMBER. 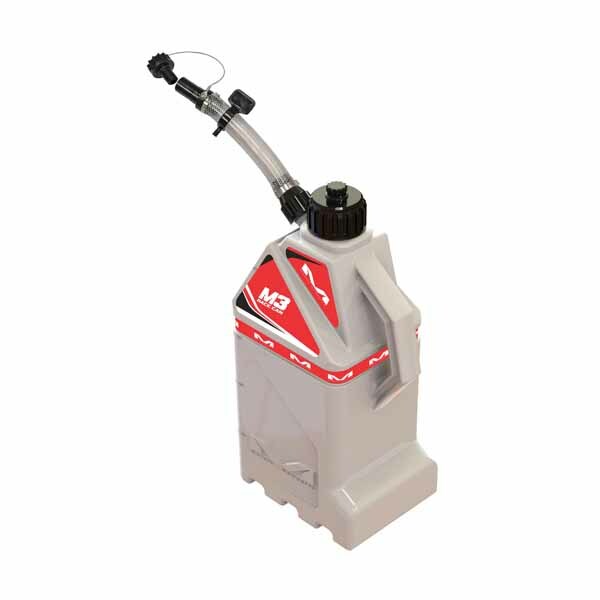 Comes complete with transportation cap and 5" long extender hose spout with 1 - 1/8" plastic fill reducer with cap. 3” extra wide fill cap or easy and quick filling. Strategically placed side handle and special unique bottom handle for balance and easy handling. Made from hi-quality HDPE plastic with heavy duty wall thickness. Utility Can includes an indent that allows the use of Matrix Concepts tie-downs to strap into place during transport. Exclusive “name and number panels” give you the ability to personalize it, giving it the custom factory look. The Matrix Concepts M3 Utility Can is intended only for use as a rapid refueling device for racing vehicles used in professional off road and closed coarse competition racing events. It is not a portable fuel container described by ASTM, EPA, CARB or other state or federal agencies. Intended for racing fuel only; not to be used for street legal fuels.